RETURN TO SPIRIT LAKE has been given 5-star reviews on Amazon.com and goodreads.com. 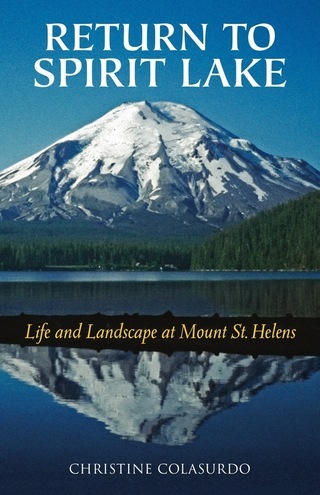 It is recommended as a "must read" for anyone visiting Mount St. Helens and was recommended by The Portland Mercury as a "Good Read" for 2016. Author, teacher and artist Christine Colasurdo teaches creative writing and calligraphy at the Multnomah Arts Center in Portland, Oregon. She is a recipient of 2010 Fishtrap Fellowship and an award-winning poet. She was born in Portland and earned a double Bachelor of Arts degree in French and English from Portland State University in 1984. Upon graduating she moved to France, where she studied at the Université de Poitiers for a year and worked in Paris for two years. After returning to the U.S. in 1987, she worked as a graphic designer, writer, and editor in San Francisco, California. She earned her Master of Arts degree in English literature from U.C. Berkeley in 1992. Colasurdo has created two museum exhibits about Mount St. Helens at the Cowlitz County Historical Museum, in Kelso, Washington: “Spirit Lake Remembered” in 2000 and “Hiking the Harmony Trail: Meditations on a Changing Landscape” in 2005. She exhibited “In the Land of Loowit” at the Vollum Institute in Portland, Oregon in 2007. As a volunteer, she has served on the board of the Mount St. Helens Institute. She has also worked for many years as an activist to protect the Mount St. Helens National Volcanic Monument and its surrounding lands from proposed activities such as road-building, development, and mining. Her proposed name (“Tamanawas”) for the volcano’s new, post-1980 glacier was a finalist with the Washington State Board on Geographic Names. As a lettering artist and teacher, Colasurdo has exhibited her art in regional and national exhibitions and has taught calligraphy classes for many years. She has also written on calligraphic topics for the international magazine Letter Arts Review as well as the quarterly publication Alphabet. In 1997 and 2003, Colasurdo created two public schoolyard gardens in San Francisco featuring native plants of coastal California and organic herbs, fruits and vegetables. She taught outdoor science at Sunset Elementary School and wrote about gardening and nature-related topics for public radio KQED FM. In 2006 she returned to her hometown of Portland. Visit her Events Page to see her offering of classes, readings and presentations. Christine Colasurdo is collecting memories, photographs, stories and other items regarding the pre-eruption landscape of Mount St. Helens. If you have a memory or photo to share, please email her at christine@christinecolasurdo.com. A massive coastal landscape is captured in one concise book.